For the past eight years I have been making bread at home, using a no-knead method, baking in vessels such as a clay baker, or on a stone or pan, always covered except for a few minutes at the end for browning. For about the past two years I've concentrated on sourdough baguettes: starter, flour, water, salt, a little instant dry yeast, ascorbic acid and diastatic malt powder. I typically use a mixture of unbleached bread flour from Arva Mills and atta. The dough is refrigerated for at least 12 hours and up to 36 hours before forming and proofing. The results have been variable but satisfactory. I don't use a couche, and looking for some kind of mould I got in touch with a ceramist to ask if he could make a two-baguette mould with a cover. He said he could but it would be very expensive. I recently saw a newspaper article that described the Emile Henry Baguette Baker. It's a glazed ceramic three-baguette mould with cover; full description available online. The price, $130.00, was hard to justify. I bought it anyway. The EHBB comes in black or red. The moulds are each 13 1/2”/35cm by 2 1/4”/5.5cm, thus smaller than a traditional full-size baguette, but the right size for a home oven. There is a recipe and instruction book included. When I brought the EHBB home, I had some dough on hand in the refrigerator. The EHBB recipe for three baguettes totalled about 600 g, surprisingly at only 57% hydration (70% or so is the usual level for traditional baguettes). I had 570g of dough ready to go, mixed to 70% hydration, which I was not inclined to discard. I formed the loaves and proofed them for 40 minutes in the BB as instructed. Formed into three baguettes, 570g of dough is much too small for the moulds, and 600g would be no better. First adjustment for next attempt: make only two baguettes with this quantity of dough. I preheated the oven and baked at 460 degrees for 25 minutes in accordance with the instructions. No surprise that this was insufficient baking time because you don't preheat the BB. I added ten minutes baking covered and six minutes uncovered. The result looked good, but, my fault, the loaves stuck and had to be pried out, leaving bottom crust behind. The instructions say for the first several times sprinkle the moulds with a generous quantity of flour to avoid adhesion. I used far too little. The bread was still pretty good, but unsightly. 1/4 tsp ascorbic acid and 1/2 tsp diastatic malt powder. This totalled 600 g, but when I weighed the dough to divide it for two baguettes I had 650 g. I think the miscalculation was failing to account for the water in the sourdough starter, I proofed and baked it anyway. Note that the miscalculation would produce 70% hydration. The two baguettes fitted fully into two moulds. Baked for 25 minutes at 460 degrees they were underdone (see above), so I added ten minutes covered and six minutes uncovered. For the future: the covered baking time will be not less than 35 minutes in the preheated oven. The oven spring was sufficient to cause one loaf to stick slightly to the unglazed interior of the lid. The loaves also stuck a bit to the sides of the moulds although I had used much more flour. 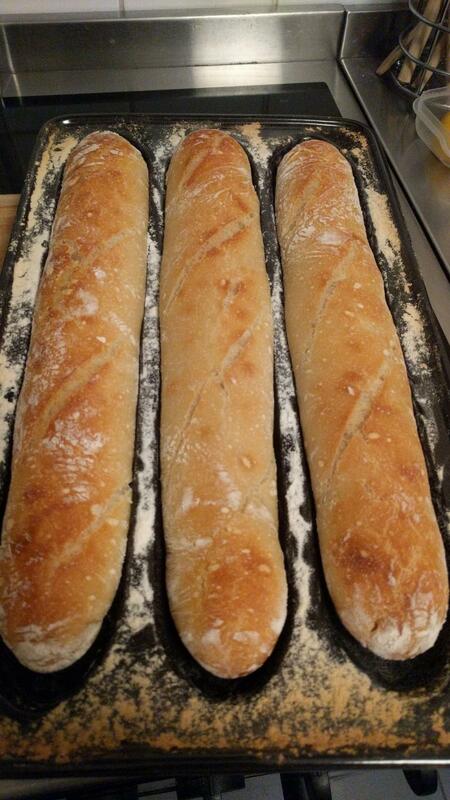 But the result was spectacularly good baguettes with a thin crunchy crust, tender chewy crumb and deep tangy flavour. So for next time: somewhat less dough for two baguettes, and try, with misgivings, 57% hydration in accordance with the EHBB recipe. And flour the moulds generously. Ascorbic acid and diastatic malt powder as above. This would total 560 g at about 60% hydration. I could not fully moisten the flour with this formula, so I added 15 g of water, which brought the weight to 575 g and hydration to about 64%. Formed two baguettes, which were a good size for the moulds. Proofed for 40 minutes. Floured the moulds liberally. Baked in preheated oven at 460 degrees for 35 minutes covered and 3 minutes uncovered. Loaves released from the moulds; no sticking. The crust was a bit too thick and hard. ; the crumb was a too tight. I suspect these defects were the result of hydration less than 70%. The flavour was excellent as in previous examples. It appears that the right amount for each baguette in the EHBB is 280-300 grams. The recipe book provides other recipes for other shapes, for example ficelles, three of which require 420 grams of dough. The book calls these ”bread sticks,” but I think of a ficelle as a slimmer baguette. I haven't tried this yet; 420/3 =140g per ficelle, which suggests a bread stick with little or no crumb, especially if one follows the EHBB proportions to achieve 57% hydration. This produces total weight of 600 g and hydration at 70%. Formed, proofed, slashed and baked as above. The quantity of dough, 300g per loaf seems right as a maximum. Still some sticking. Not enough flour in the mould ? What will be the result if I clean the BB thoroughly, but don't wash it ? Crust was thinner and crunchy, alveolae were larger and irregular, chewy crumb. Flavour excellent. This produces total weight of 580 g and hydration at 70%. I had cleaned the BB dry, without washing it, and floured it. Formed, proofed, sprayed lightly with water as specified in the EHBB recipe book, slashed and baked as above. The EHBB book uses the term “bread stick” for ficelle, which is, of course, incorrect. Their recipe is for a ficelle with olives. My dough was 2/3 of the Fourth Attempt formula, which produced 400g at 68% hydration. Divided into three ficelles, 160, 140 and 100 g each. Proofed, slashed and baked five minutes less. As expected, the 100 g version turned out like a bread stick; 140 g had insufficient crumb; 160 g was satisfactory. I think 180 g would be ideal for a ficelle. Mixed, autolysed , stretched, folded and refrigerated all in the sequence as prescribed: see the post by Snyder on the Fresh Loaf site: http://www.thefreshloaf.com/node/8242/anis-boabsa039s-baguettes. Even at 75% hydration the dough was easy to handle. 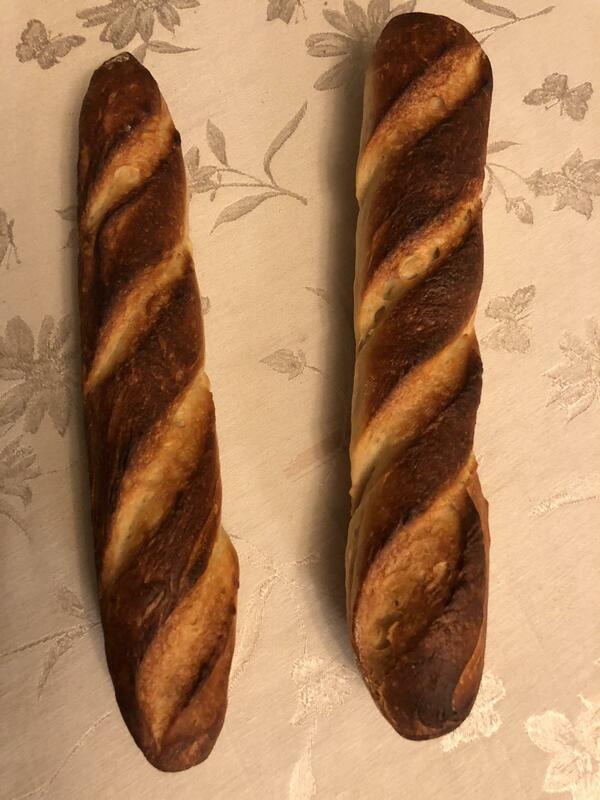 Formed, proofed, slashed and baked as above, this produced two excellent baguettes, with thin crackly crust, open-holed chewy crumb, but rather bland to my taste. No sticking in the moulds. Next time I'll add the ascorbic acid and malt powder. Same as Sixth Attempt, but adding 1/4 tsp ascorbic acid and 1/2tsp diastatic malt powder to the mix at the same time as the yeast. The difference in taste was dramatic; slight tang, and very much deeper and more complex. This will be my standard baguette formula and method. The EHBB recipe book is incorrect in formulating dough at 57% hydration, rather than 65-70%, or 75% if you prefer the Bouabsa formula. The recipe book is incorrect in stating the quantity of dough per baguette. The correct amount is 280 g to 300 g (maximum), rather than 200 g (600/3) in the book. 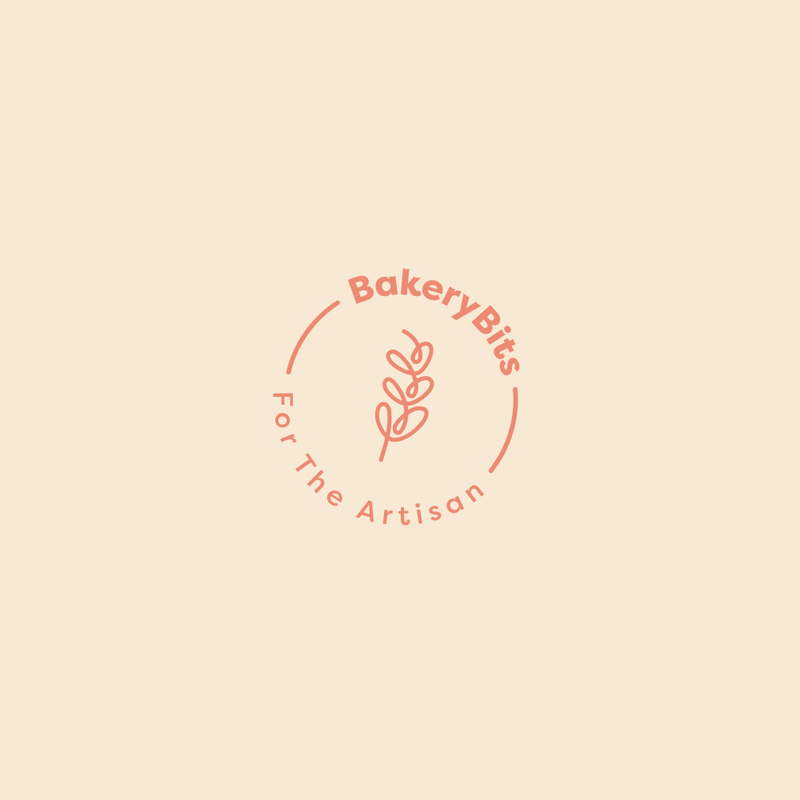 The recipe book is incorrect in stating a baking time at 25 minutes covered after preheating the oven at 470 degrees, because the BB itself is not preheated. The correct baking time is 35 minutes covered in the preheated oven, followed by 4-6 minutes uncovered. The recipe book is correct in saying that the moulds must be generously floured for the first several uses to prevent sticking. The EHBB is a worthwhile addition to one's arsenal of bakeware, if one can accept the cost. What an effort you made to get everything right; your attention to detail is very much appreciated! Do you have photographs of your 'perfect' baguettes? Sorry, no photos. I really should take some. After a number of further experiences, I realized the crust produced at 70% hydration with baking times as above was somewhat too thick and dense. Using the same Bouabsa 70% formula, I preheated the oven to 500 degrees, and baked the baguettes covered for 25 minutes and uncovered at 475 degrees for five minutes. to you, Krusty. You have no idea the time and frustration your post has saved me. Yesterday found me in an extreme "poor me" state and looking through a new Chef's e-mail, I came across the EH Baguette Baker which was perfect to soothe my condition and out came the credit card. I have never been able to produce a decent baguette yet, so with my new red baker and your EXCELLENT step by step of do's and don'ts, I will be an expert in no time. Thank you so so much for all the time you spent in detailing your experiences for us. Krusty-I too want to thank you for your excellent post. I bought one of the Henry's. My first attempt, I did not flour well enough-I used rice flour, and thought I had, but massive sticking. My wife, who doesn't bake, suggested spraying some olive oil on the baker. I looked at the directions again, and thought if that was a good recommendation, they would have said that. Then I thought, but my wife is smart, so I followed her advice. I sprayed some olive oil, then used a light dusting of rice flour-no sticking. Since that second attempt, I have baked in the Henry probably 15 times-I have tried using the olive oil spray alone, and once in a while a teeny stick. If I use a very light dusting with the rice flour with the oil, no sticking. price for a tray and lid ! I have one of these trays..
Works a treat. Never had any stick with a generous dusting of semolina. Needs about 380g of dough per baguette. I would get it replaced. I would get it replaced. Mine does not wobble. Its nice that this thread is still going. Kevin-I have a Wolf steam oven, so I bake with the steam-I bake with the top off, so the holes in the top are not an issue. Seriously wondered why EH put the holes in also when I bought it. As an experiment, some time I am going to bake using the top with the steam just to see how that turns out. Kevin-When I went to SFBI for the Artisan Bread week, I learned how important steam is. So when my wife and I were building our house, I decided to get the Wolf steam. It works very well, it steams for about two minutes initially and then stops steaming-it has several programs that you can bake with. I use the Wolf Gourmet A11 setting. But they also have, for instance, an Auto Steam Bake setting. I use the Wolf Gourmet cause it turns off automatically, so I don't have to be watching it. I wouldn't be without it. Kevin, pushing you along, I hope you forgive me but it's time to work on your scoring technique now that you have such a nice crumb and crust. :) Scoring that is more parallel to the length of the baguette. 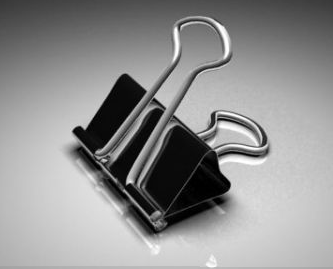 I often use some of these metal paper clips to hold pans together. 3 minutes and well demonstrated. Thanks for posting the link! 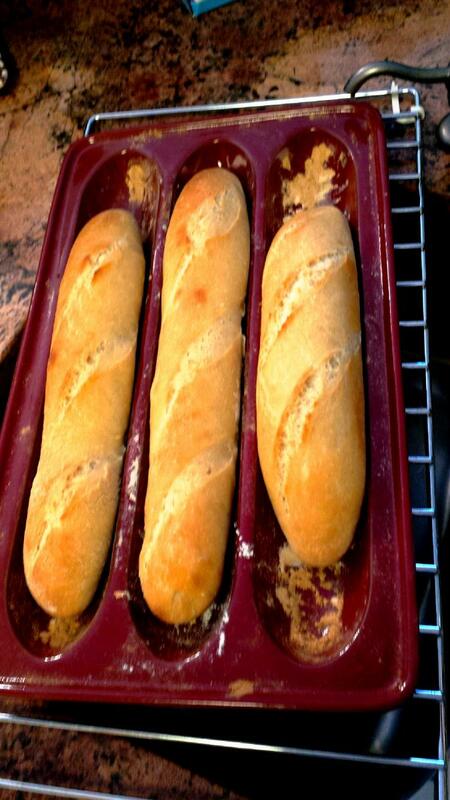 I never preheat the baguette baker-I have stopped using any semolina or rice flour-I just spray it with oil. Kevin- No I haven't tried it with pre-heating, although that is surely a good way to use it. I use a steam oven, and the program is set to steam for 2 minutes, then go to convection, so if I were to preheat, the steam would not come on, since its set to turn off at greater than 175 degrees-in other words, it won't steam at temperatures greater than 175. Kevin-Sounds like you have figured out how to use the baker the best for your oven. I have a Wolf steam oven, so I bake them uncovered in it. It steams for 2 minutes, then shifts to a standard bake without steam. I also have the Henry bread loaf baker-its a covered pullman pan and has two holes in the bottom and 2 in the top. I recently baked a loaf in my wood-fired oven, the day after pizza when the temperature was still 400 degrees F. I baked it covered for 30 minutes, then uncovered for 30 minutes and the loaf was really good. I am going to think about your retrofit for the baguette baker, and probably get some plugs for this pullman. I wish the same for your baking endeavors for 2016! Kevin-my oven is a Forno Bravo, and its designed to hold 400 degrees for 24 hours. The Henry pullman pan worked great in the wfo. I have also used it in my steam oven, and it works great there. I did put parchment paper on the bottom of the pan yesterday, so the dough would not seep out the bottom holes while proofing. Thanks for the tip on the silicone plugs. I just made my first serious attempt at baguettes and used an Emil Henry baguette cloche. I'm thrilled with the results. Thin crispy crust, beautiful open crumb. I used Sam Fromartz's recipe though I used flour instead of olive oil to facilitate handling. Cooked it for 15 minutes with the lid on and 7 without at 470 degrees. I definitely need work on my scoring but other than that I'm thrilled. I even signed up for the forum here just to rave about the cloche. I am a casual home baker and I've just been baking artisanal bread for a few months after making a sourdough starter. I don't think I went deep enough. I did the vertical overlapping ones like the experts on youtube demonstrate. I used a knife, no lame. Will go to the drug store and buy some straight blades for my next attempt. The 2nd two loves of the batch of 4 looked a bit better. I preheated the cloche with the oven, then sprayed with oil and dusted lightly with cornmeal. No problem with sticking. Kevin-Sorry to be late replying. I don't think the WFO is steamy-what I have seen is folks using a container with water in it to moisturize the oven. I have also seen people use a sprayer to try and generate steam. When I have baked bread in my WFO, I have used a cloche or some other covered baker. I should try baking without any cover, just on the floor, but I haven't. I know from watching videos that many bakers bake exclusively. I have never seen a WFO with an attachment for steam, like in a commercial bakery. Did you spray the loaves or is that crust all from the steam oven? what kind of steam oven do you have? is it commercial or meant for the mortal home bakers? Kevin-no those were done in my steam oven, uncovered. Esther-no spray, the steam oven steams for 2 minutes then goes into convection mode. There are more steam ovens coming onto the market. I saw one the other day in a store that is a small counter top oven. When I went to SFBI for the artisan bread week, I learned just how important steam is. There, we would activate the steam for only 10 seconds which flooded the oven massively with steam. Here's my 2nd go round. The scoring is better but i still need to work on it. I used an exacto knife this time having no access to a lame. After reading comments on this site, next time I'm going to use a serrated knife. I used half as much yeast this time and think it worked better. Esther-those look great! My wife and I like the crust carmelized, so thats why I bake them hard. Another batch in the oven. I used a Kuhn Ricon nonstick serrated knife for scoring and it went right through the dough nice and deep without sticking. Can't wait to see the results. I use a very, very sharp Japanese Global Ni knife. Works great. I was using a very sharp Global and it was dragging and sticking. Probably my technique. Anyway I'm pleased with my results today. Two loaves I took out early to freeze for later use. Will finish baking when I need them. The fourth 1/4 of the dough is going to be pizza for tonights dinner. Esther-It was most likely your technique. The photo I posted above of my mini-baguettes was scored with my Global Ni. Scoring, especially baguettes, takes a fair amount of practice. It's wonderful to see so many posts deriving from my original one in September 2014. I've used the baguette baker at least two hundred times. I've tried filling the holes with silicone plugs; thought it worked better without. There's no sticking at all. Clean it dry with some scrunched-up foil. After mixing the dough is refrigerated for anywhere from 24 to 48 hours depending on my schedule, with two or three stretch-and-folds in the mixing bowl. Form dough into loaves and proof in the baguette baker (no need for a couche) covered with a towel. if you then let the surface dry a bit the slashing is much easier. Preheat oven to 450 and bake for 30 minutes covered with lid, and 6-8 minutes uncovered. Finally found this page! Such a relief, because I thought the instructions by EH would be right and that therefor I did something wrong: not forming the baguettes enough, or too much... not adequate flour, too much or too few yeast, or maybe the oven didn't function how it should... Following the instructions here the baguettes finally looked great. Still don't understand how EH detailed some things wrong. But anyway... I would like to ask some questions: with an electric oven, do I best use the heat below AND above? And where to put the EH baker in the oven (below, middle or above it)? No need to sprinkle water in the beginning because the EH baker keeps the moist inside, right? Yesterday I had the oven at 280ºC and put it above the center in the over, close to the top where is the grill. After 30min took of the lid and the baguettes where done and looked fabulous. I tried it again today but not with the same result... Maybe I was just lucky yesterday and it's best to have the oven at 250ºC? I don't know the answer to the above and below heat question. I have a steam oven, and I bake with a program. I think you should try both ways to see which is best. No need to sprinkle water, the purpose of the baguette baker is to trap the steam. Because I have a steam oven, I do not bake with the top on at all. I think 280 C is too hot, but often ovens are not accurate with their supposed temperature. The mini-baguettes I baked that are in the photo in this thread were baked as I mentioned, but never higher that 400 F (205 C). Thanks both of you for your answers! I will try convection mode, haven't tried thát yet. My oven is a steam oven, and I will try WITH steam + id off, and NO steam + lid on. BUT in a booklet I found on internet it says to bake for 25 minutes with lid on and 25 minutes without the lid! seems like a long time for a baguette. Or does it sound right? Mini-the program on my Wolf steam oven takes 47 minutes. I bake the whole time with the top off, though. Been lurking here for a while, so I thought I would post a picture. They don't look as nice as Mr. Snyder's version but I am pretty happy with them for my first real go with the baker and the recipe. Haven't tried them yet, but assume they will be pretty tasty. German 405 flour, hopefully that is ok. Either I'm terribly naive, have poor vision or am too easily pleased but having read all these letters on the trials and travails of baking baguettes, I am amazed that people go to such trouble: I've been baking at home for more than 40 years and simply roll out my baguettes, lift them onto a cornmeal coated peel then slide them onto a baking stone in a 475 oven . Couple of cups of ice cubes in a cast-iron-frying pan on the bottom shelf; close the oven door and 25 - 30 mins later, three golden, crusty, delicious baguettes. No cooch, no pans, no sticking! What am I doing wrong? Ha ha ha so funny... And may I ask how much water and flour do you use? I recently got there Emilie Henry baguette baker and finally had the opportunity to use it. I used Peter Reinhart's Pain de Campagne in his BBA book. This was my first attempt at baguettes. I have to admit, I was a bit intimidated after reading this forum. So many postings on sticking, and concerns about the venting holes made me wonder if I made a mistake purchasing this at all. However, I am happy to report I encountered none of those issues. I chose to preheat the baker at 500 degrees, I used a little brown rice/for mix sifted into the pan before loading my proofed baguettes into the baker's troughs using a wood plank. I baked at 450 degrees (after preheating to 500) for 16 minutes, then removed the lid and baked another 12 minutes (until sufficiently browned). End result was a perfect spring and bake, with no sticking and whatsoever. While this is my first time using the Emilie Henry baguette baker, based on this experience, I would recommend it. Though their instructions appears to be written for the novice (and not advisable). Using this baker, and some simple common sense experience should make this a very useful tool for the homes baker. Isn't it the pre-heating that takes care of the sticking? I always preheat the big EH dutch oven for boules and have never had sticking problems. How do you load the baker? I have the EH baguette baker and I have always preheated it - it does not make sense to me to NOT preheat it, then I would not need it at all. But my problem is: How do you load the baguettes into the baker when they are proofed? I find it very diffucult and the baguettes always deflate almost completely when placing them into the molds of the baker. my Emile Henry baguette arrived today! I got to work,on making baguettes for the first time ever....first one came out too dark; second one could of used a few more minute. Nicely formed loaves, and yes, it probably will take some work to dial in the right timing to get the color you want, though the second batch looks pretty nice. My wife gave me one for my recent birthday and I used it today for the first time. Results were variable. I've been chasing my idea of the perfect baggie for months and had finally arrived on a method that gives pretty good results. But the EH baker raised the quality to a new high in my opinion. For this first time, I followed the recipe in the included booklet, knowing that others have tweaked it. I figure I can tweak it later. I preheated the oven to 475F, but did not preheat the baker. After resting the dough, I placed the baker in the oven onto a preheated baking stone and reduced the temp to 450F. First, the bread was great. Nice crispy crust and open crumb. Couldn't ask for better. BUT, there were a couple of glitches. The dough rose enough to stick the adjacent loaves together, resulting in a bit of damage when I removed them. Second, I noted the loaves sticking to the bottom along the upper sides of the "trays". I had coated the trays with oil, but apparently not high enough. Still, the bread came out as good as I could want. Maybe not perfect, but best in MY opinion. Next, I'll reduce the dough volume somewhat and do a better job of coating the pan. Perhaps adding flour or maybe line the pan with foil or parchment paper. After a dozen or more attempts using the EH baker, I think I have everything tuned in. As previously reported, I (and others) had problems with the loaves sticking in the pan. My first try resulted in really good baguettes, but they had to be heavily damaged to get them unstuck, aka Krusty. So, here's where I am now. To begin, I exactly followed the recipe in the instruction booklet. Add yeast to water and mix. Add salt to flour in a mixing bowl and mix. Add yeast/water to flour/salt and mix/knead for 6 minutes on speed # one using a KA mixer with dough hook. Cover with plastic wrap and let rise in the oven at about 90-95F for 40 minutes. Return bowl to mixer and knead again for about 1 minute. Preheat oven to 475F (I use the convection mode). Rub the upper parts of the three toughs with butter and spread about 1/2 tsp of olive oil over the rest of the troughs. Meanwhile, divide the dough into three parts. Mine are about 225 g each. Make a couple of folds and press each piece, then on a well floured surface use a rolling pin to form an oblong shape about 5x12 inches. Roll into a loaf and pinch the dough together. I ended up with a log about 1.5" diameter x about 15" long. Place all three into the pan. I wet the interior of the lid to get a bit more moisture into the pan. Put the lid on the pan and let the dough rest for 20-25 minutes. After the final rise, score the dough, return the lid and bake for 30 minutes at 450-460F with fan on. Remove the lid, switch the oven to bake (fan off), and let the loaves brown (about 5-6 minutes). 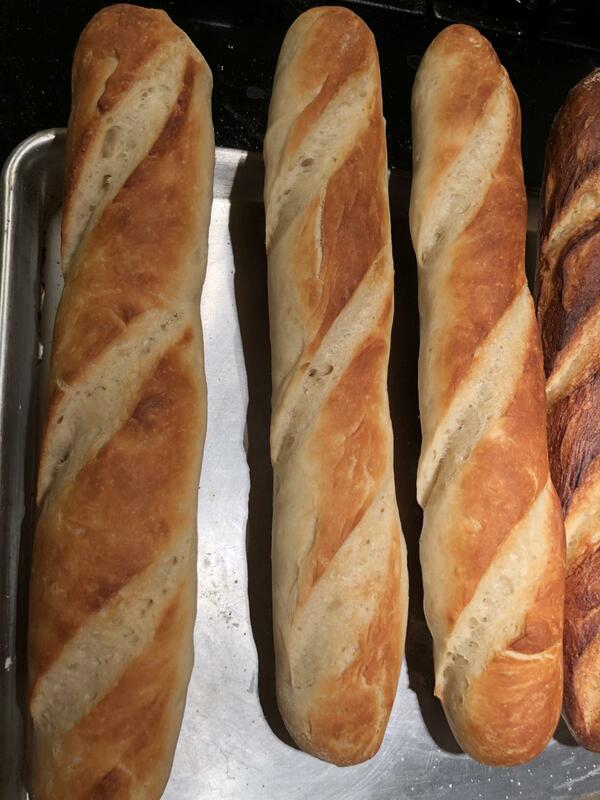 Voila, perfect baguettes. The issues with the pan itself seem to be sticking bread and the time of baking covered vs. uncovered. I think all others are dependent on the recipe used and not on the pan. As for sticking, it appears that the pan does take on some "seasoning", somewhat like a cast iron skillet. I use a balled up wad of aluminum foil to remove any residue and then wipe with a paper towel. I never use a soap solution nor put it in the dish washer. The time of baking I use is 30 minutes covered and 6-8 uncovered. Every loaf I've checked has an internal temp of 203F. Perhaps different ovens will require adjustments to the times. That's about all the story I can tell. Keep tweaking your EH baker and good luck. at $99 it sure seems like a good deal. mine is in the oven now for first attempt and I must agree with Krusty. Their recipes seem to be off the mark. The traditional bread recipe in the booklet comes in at about %60 hydration and seems pretty solid to me. I'll know soon enough ! Some dumb reason I usually follow manufacturers instructions for the first go around …. then ditch'em and do my own thing.